We’re not the only animals that get by with a little help from our friends. A report published last week in the journal Science shows that prairie voles can sense distress in other voles and will rush to comfort them, just like humans. Scientists are hesitant to ascribe emotions or motivations to non-human animals. As a result, the general consensus has become “animals don’t have emotions,” a statement that tends to rankle both animal lovers and certain ethologists (animal behaviorists). Primatologist Frans de Waal is one of those people. He’s spent decades studying nonhuman primates and other animals, and believes the human capacities for morality and empathy are far from unique. The difficulty lies in proving it. Designing an experiment that will unequivocally demonstrate a certain emotion is extremely difficult for two reasons: first, we can’t just ask other animals what’s going on in their heads, and second, such an experiment would have to control for a lot of other variables. The results would have to show that the animals weren’t motivated by anything else, which is pretty hard to pull off. There have been some successes; one study showed that dogs enjoy being generous with their friends, while another showed that the reverse is true for capuchin monkeys. The recent prairie vole study makes another compelling case for animal emotion. The experiment included not only watching pairs of roly-poly prairie voles (Microtus ochrogaster) to see how they behaved, but also analyzing their brain chemistry and activity. Prairie voles are an especially social species, living in colonies that would definitely benefit from empathetic behaviors. The researchers studied the voles in pairs and found that when one vole was distressed, its partner would respond by rushing to groom it. Humans and other primates tend to console each other with hugs and kisses, but for voles, grooming is the way to go. Voles who knew each other were quicker and more likely to approach and groom, a behavior that mirrors the gift-giving dogs’ preference for their friends over strangers. The comforting behavior had both chemical and anatomical components. The experimenters found that oxytocin—commonly called the “love hormone” for its association with romantic and maternal love in humans—was a major driver of the voles’ empathetic impulses. 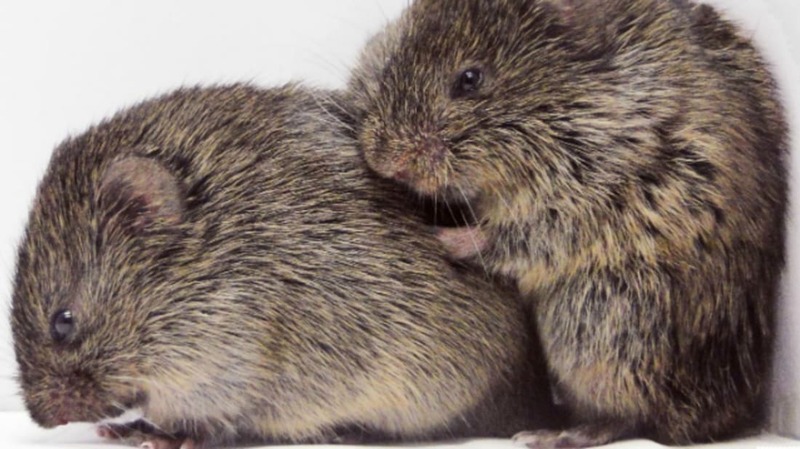 When the scientists shut off oxytocin signaling in the voles’ brains, the rodents became less concerned about their partners. The researchers also found that seeing other voles upset or in trouble activated a brain region called the anterior cingulate cortex—the same part of the brain that gets to work when a human sees another human in distress. This type of brain activity has been shown in non-human primates before, but never in other animals.